A couple of years ago, a friend asked Ed to play his trombone for a performance of Utopia, Limited, and a love for Gilbert and Sullivan was born. When Ed discovered that the Lyric Opera is performing The Mikado, he immediately ordered tickets online. Voila – the perfect gift for his wife! I might have teared up a little bit when I discovered the tickets on Christmas morning. At the beginning of December, I bought a cute decorative sled at Hobby Lobby, along with greens and sparkly doo-dads with which to fill it. The supplies sat on my dining room table for about three weeks. In an attempt to clean off my table, Lily and I finally put our little sled together. We added some lights, and set it on our front porch. It looks quite festive! Sunday mornings, our church has “coffee and…” after services. When Emmy realized that unlike a Sunday morning, there were no snacks after the Christmas Eve service, she threw a fit. What’s a three year old to do when it’s past her bedtime and she’s hungry? Throw herself on the floor screaming for some snacks, that’s what! What’s your addition to this list? I am sure that gift blew you away! How thoughtful.And I love the sleigh. Tickets to The Mikado! So romantic! I am green with envy. And you know, that Christmas Eve meltdown was the perfect time to pull out that most pathetic and manipulative last ditch mom line of all…"You'd better watch out. You'd better not cry…"
Sounds like the perfect gift and you get to go to the Opera, hooray! 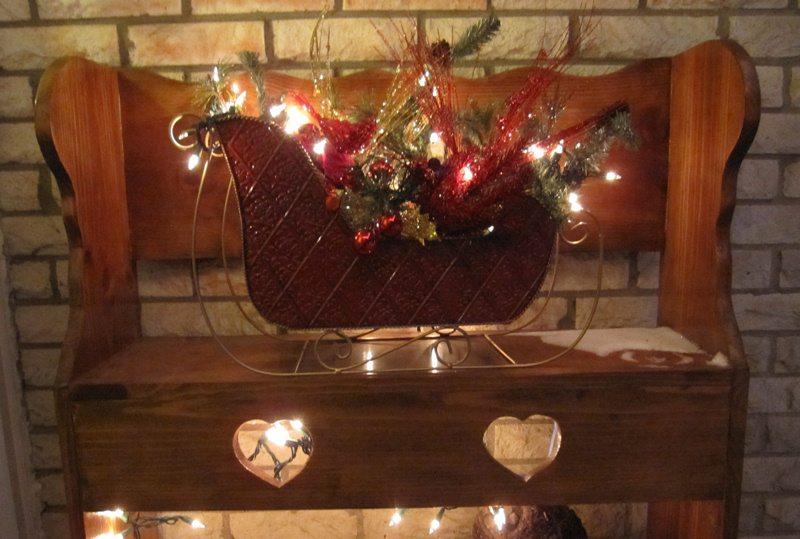 The sleigh you decorated is beautiful. It fun to be a proud moma, I am sure the audiance was full of them! Of course your girls were the best, I know that! Hope you get that letter out soon so get off the computer and work on it. From one procrastinator to another I must say the sled project turned out quite nicely. And a letter after Christmas, what a great idea! I decided not to even do cards this year! This was a very fun post to read. I, too, relate to the tantrum thing. My daughter had one of those when she was little between the Christmas programs. I mean two programs in one day, was expecting too much this time of year from a three year old! It was a doozy of a tantrum too! Now it makes me smile when I remember it. Think about that whenever your kids misbehave, it helps. Happy New Year to you and your family. What a creative and fun post…I was introduced to opera with my children through home schooling…I love it. So understand the melt down moments…how can you not being a parent.Enjoyed the song….it is great. My son plays violin so I always love seeing someone play the violin.Happy New Year!! !